My Destiny – Life, love, and the people and experiences who make it all worthwhile. I started to play the violin at seven or eight years of age. My maternal grandmother’s family were all musically talented, and as my older sister Bernice was already playing the piano, my grandmother decided that I should play the violin. I remember my father buying me my first instrument and bringing it home. I unenthusiastically removed it from the case and made an attempt to play it. It sounded dreadful. It definitely wasn’t love at first sight, but like so many unpromising beginnings, my love for it grew. Mother Cecily was the resident music teacher in Loreto College Crumlin where I attended school, and I remember happily gathering up my school bag during lessons and escaping the classroom twice weekly for music tutorials of 45 minutes duration. It was many years before music as a subject became an extra-curricular activity which took place after school hours. But while I was I with Mother Cecily I didn’t spend too much time wondering what I missing back in the classroom. Cecily was an ancient tiny nun, who wore glasses that magnified her eyes so much, that she resembled an owl. She was passionate about music, and most of her pupils adored her. As time went by, I also learned how to read music, as each lesson included musical theory, sight reading and information on great composers and musical artists. I spent many happy hours in her little music room and as I progressed I entered and won several competitions and Feis Ceoil’s. By the time I was twelve years of age, I was old enough to join the school orchestra. We performed at various events throughout the school year and competed with other schools in orchestral competitions. A couple of years later when we teamed up with the Castleknock College Boys School orchestra, there was a sudden flurry of teen aged Loreto girls who begged to join the orchestra never having played an instrument before, pleading with Mother Cecily that they could quickly learn to play the triangle or other percussion instruments. Cecily gently insisted that they would have to know how to read music in order to become part of the orchestra, and many hopes were dashed, as being part of this musical ensemble suddenly became very cool amongst my peers. Travelling out to the boarding school in Castleknock by hired bus every other Saturday was always an adventure, and after practice when Mother Cecily and Father Fehily went to take tea, we had an hour or two to gallivant and hang out with the lovely boys of Castleknock in the grounds of the college. I remember this period in my life as being great fun and I kept in contact with a few of those boys throughout my teen and early adult years. My father had only one sibling, his brother Tommy who had never married. He was a skilled carpenter like my dad, but he enjoyed making musical instruments as a hobby. One Christmas he presented me with a beautiful handmade violin. It was remarkable. Each peg had mother of pearl and nine carat gold embedded in the wood, and the fingerboard featured an unusual treble clef motif in Ivory. The back of the violin was exquisitely inlaid with a mother of pearl rose whose petals held various hues and colours. It was absolutely unique. Tommy had spent almost a year, sourcing materials and crafting this precious gift for me and I had never owned anything so beautiful. It didn’t come with a case, and when my father and I went to the music shop Mc Cullagh Piggott’s to buy one, we realised that the instrument was slightly larger than a standard violin so we couldn’t get a case to fit. When I returned to school after the holidays, I carried the instrument in a makeshift soft bag that I had cobbled out of old jumpers. When Mother Cecily saw it, she rooted out an old ungainly wooden handmade case that looked like a coffin but the new instrument fitted inside perfectly. As my violin was slightly bigger than a standard one Mother Cecily used me as a viola player when the need arose. We simply switched strings and I became the ‘viola section’ of the orchestra. The viola is the second instrument in the string family, graduating on to the cello, and finally to the double base. Being part of the violin section of the orchestra, I performed with several other players, but when my violin became a viola, I was always playing solo. I enjoyed the deeper tones that the alternative strings produced, and I also enjoyed the magical status that my violin held. It was a two in one and very special. Because the wooden case was cumbersome and very heavy, I left it on a rack in a school corridor with other instruments and practised at home on my old violin. Leaving instruments on the rack in school was a common practice, and although they stood in a busy corridor, these instruments were out of bounds to pupils and were never touched or moved. On our trips out to Castleknock, it was simply lifted and placed on the bus, along with all the other violins, cellos, flutes, clarinets, oboes and various percussion instruments that were also often left on the rack. Uncle Tommy only visited our house about twice a year, but the violin was always brought out and I performed for him. He enjoyed classical music and it was a shared subject that we could talk about. I was an awkward teenager, and he was a bachelor with limited experience of kids, so the instrument and the music gave us opportunities to chat and to enjoy each other’s company. One Saturday in early summer I went into the school to collect my violin as I had a competition later that day. I went to the rack and opened the case, but the violin was not inside. It had been stolen sometime between the previous day when I had had a lesson and that morning when I called to collect it. Despite a thorough search of the entire school the violin never turned up. Fliers were sent around, and every teacher asked every class if anyone knew what had happened to my violin. No one came forward and the instrument was never found. Sadly the nuns refused to take responsibility for its loss. I felt so bad. My mother believed that I was at fault and had somehow ‘lost it’ or left it on the bus (as I had done a few years previously with the older violin, which was recovered from the C.I.E lost property office a day later). When Uncle Tommy came to visit that Christmas, my father and mother lied to him and told him that the violin was in school in the “big case” over the holidays, as they believed that it would break his heart to find out that it had been stolen. I still remember playing my dishonest musical renditions for him on the old violin that Christmas. I felt guilty with every note that I produced and cut short the performance that I usually basked in. He died the following spring never knowing that it was gone. The heart of playing the violin left me after that, and despite still having my older instrument I subsequently left the orchestra. The old violin was eventually passed onto a younger cousin, along with the sheet music, books, music stand, and other paraphernalia associated with it. After I left school I took my musical knowledge and got a job in Walton’s music store in Dublin where I worked very happily for over four years. Over the course of those years, many second hand violins were brought in to the shop to trade up to newer instruments. I kept my eyes out, and all the sales staff knew the story of the stolen violin. But I’ve never seen it again. I sometimes trawl through the Internet in the hope that I might stumble across it. I don’t know what I would do if I found it, I just know that I would recognise it in an instant as there could never be another one like it. Destiny can often be about still appreciating things that are given with love long after they have gone. As we go through life we encounter many obstacles. We stumble over them, we navigate around them, and we plough on forward. It’s a one way street. Reflecting back on my life, I recognise that there have been many boulders along my path, and I know that I have steered my ship through many stormy seas. Like many others I didn’t get a life raft and I had to learn to swim with sharks in order to survive. (forgive the overuse of metaphors in this piece of writing). I realise that many of the blocks in my lifetime have been caused by people, their actions and reactions, their opinions and their viewpoints.. When you are trying to muddle your way out of a situation that largely affects you and only you, the decision to sink or swim is down to your own desire for survival. In my late teens, the transition from being a single girl about town to being in a relationship was a new adventure for me. It suddenly wasn’t just all about me and my own endurance. Amazingly I was thrust into being the other half of a ‘couple’. Thinking and acting as one as we ventured forth into marriage and a grown up life where problems were shared instead of having to go it alone. As a parent, passing on wisdom to my children was part of the job that I signed up to on giving birth. At times information and advice was well received, and at other times it was scorned and ridiculed. It’s always difficult to find a balance, and I understood (but not always liked) this awkward conundrum between parents and their offspring. Like many others I’m sure, I have a passionate and overwhelming love for my now adult children, and I have attempted to protect them throughout their lives. Sometimes I have been over zealous and controlling (when they were teens) and other times I have been ill informed about particular circumstances and defended them when I should have taken a step back and listened to others. In my defence, I usually reacted about what I perceived was unjust behaviour and acted upon it even when it turned out that my offspring were at fault. Like me, they have flaws and are imperfect. Time has moved on, and my children are now fully grown and are on their own pathways through life. They are in charge of their own vessels and have had to learn to steer through life for themselves. Their dad and I are fully present in their lives, and I know that we are a supporting influence in matters of importance. Our family is very small. At its heart, there are two parents, and two kids. We fight, argue, listen and love. As parents we have opinions on every element of their lives that we are included in, and this can produce huge discussions (where no one agrees) sulks, laughter, gaiety and tears. They are both so different. My daughter is a listener, pragmatic, very kind, clear thinking, thoughtful and sensible (like her dad). My son is an action man, an organiser, flamboyant, caring, generous, kind and thoughtful. Their very individual characteristics are acknowledged and celebrated all the time. In this wonderful small life, we have all learned to love and appreciate, and to fully support each other no matter what else is happening. We have recently had the most horrendous eighteen months with the most difficult circumstances that has affected us all as a family, but that has impacted on my son Andy most of all. We have all been tested. Truth, honesty, faith in human kindness, our belief and trust in each other, and how we view those who looked at us, have been held under a microscope where strangers have gazed and judged. As a person who has minutely examined and reflected on the response of people who live in close proximity to me and my family throughout my whole life, some of the reactions have been disappointing. Despite my belief that friendship and loyalty are qualities to be treasured and nurtured, I am unsurprised by some peoples responses, but sadly my family have been. That’s not to say that I’ve not been shocked by others reactions, I have been and they have changed me and how I view them. Sincerity is something that carries huge value for me, as does integrity and truth. Blind trust these days is rarely asked, but if there is a foundation of honesty, I believe that it’s easier to make the choice between belief and doubt, and sometimes people have to make the difficult decision about which side to fall on. Truth versus innuendo/ belief versus gossip/ honesty versus lies. Having had no life raft during the past eighteen months, it’s been sometimes difficult to keep our heads above water. As a family we paddled persistently to avoid drowning and helped each other constantly as we threatened to slip under. Thankfully and happily things have changed. Perspectives are altered, new goals have been achieved, and future prospects are looking more positive. To the wonderful, nurturing, trusting people in my life who I treasure beyond measure, thank you for providing support based on the person that you know, trust and love. From the deepest place inside myself I am grateful. The hope and empathy that you have given us during our darkest days as a family, has steered us through the roughest toughest seas that I have ever encountered in my lifetime. We are navigating towards blue skies and calmer waters ahead, and we will not sink, we will swim. As a family, we will survive. Destiny is realising that anchors are the people who stabilise us when we are lost at sea without a compass. Riding on the shirt tails of my sister…..
As people I believe that we all have our own strengths and weaknesses, including the gifts that we bring to the table of life. Some we are born with, and others we cultivate as we grow and mature as adults. I have often wondered is humour and wit inherent or do we learn it? I know that I practiced being funny as a child in order to be liked and included. Growing up in a large extended family there were always lots of social occasions with siblings, aunts, uncles and cousins. As children we were expected to get along with our many cousins and I think that we did most of the time. We gathered in packs at particular family events throughout the year, and while the adults partied, the cousins did so too in different ways. Looking back I believe that it was actually a training ground for me in how to move comfortably within my extended family and how to perform in a particular way. I was an overweight child/teenager and I learned to hide my true self or to make funny rejoinders about ‘fat’ people in order to deflect any hurt that I might have felt if a disparaging joke was made. Humour was harsh and critical back then with none of the political correctness that is so prevalent today. I was the family clown. I had a very well developed personality that people commented on. I was considered outgoing and full of life and laughter. I didn’t appear shy, and I functioned really well at all these family gatherings. As I became an adult I had good friends and enjoyed socialising, conversation, and the general banter that carried me through job interviews, friendships, relationships and eventually meeting my husband, marriage and children. My sister Annie was ten years younger than I was. I doted on her as a child and there are hundreds of stories as to how we were as sisters growing up. She was also part of that extended family training ground, although times had changed subtly by the time she became a part of it socially. We became close friends as adults when I moved back to Dublin in my 30’s (married with kids) and Annie was in her 20’s. We began to socialise and to mesh our pals. We went out. We hung around with each other and spent a lot of time together. She was still living at home with our mam, but spent a lot of time with me and my family in Lucan. She liked hanging out with us. She was so witty and very very funny. She simply sparkled. We laughed a lot, yet we had serious in depth conversations about countless things, and I trusted her completely with all of my secrets. There was a beautiful lightness and frivolity to our relationship that I recognised and loved. It was always present. She was inherently humorous and had a sharp wit just like my mother’s. My children adored her. She was the ‘Cool Aunty’ when they were teenagers, and I clearly remember my daughter Jayne, sitting on the bathroom floor gazing up at her as she swept her blusher brush across her cheekbones before we went out one night. I didn’t use makeup, so my daughter learned this skill from her. I also remember the time my son Andy ‘came out’ and told us that he was gay. Annie was so supportive and cracked on about how the two of them would ‘go on the pull together’ chasing men all over Dublin. And they did. She spent a lot of time with us, and was here at the end of nights, at the beginning of mornings, mid afternoons and evenings. She sat and joked, giggled and provided fun, humour, merriment and a general lightness of being that we all basked in. When she married Mark, had Alex and moved to Lucan, she was even more present in our daily lives. Of course she had bad days as we all do. She could be as grumpy as hell, but when she smiled and chuckled, we all joined in with her. Her laughter brightened our days. When she died a light went out of my life. It sounds like a cliché but it’s true. In the short term all laughter disappeared. All joy disappeared. All lightness and frivolity disappeared. All joking disappeared. As time moved on, I learned how to be without her, live without her, function without her, and eventually laugh without her. I am only realising now that for so many years I rode on her shirt tails. I relied on her humour and her vivacious nature to disguise my own shyness and my inability to be myself. When I was in her company we were a double act. She was the funny, witty, fabulous girl that I never really was, but could somehow be when I was with her. Since her death so many people tell me I have changed. They tell me I am quieter, less funny, and less witty, but I realise now that I actually never was. She instinctively possessed those qualities, and unknowingly I assumed that I was the same as she was but I wasn’t. At the ripe old age of 54 I believe I am ok. Annie and I worked as a twosome throughout many happy years together, and without her I am continuing to live and manage life just being myself. I have my own talents, yet like so many of us I am a bundle of insecurities. I also know that without her, I am actually quite a shy person who doesn’t really like the limelight although it may sometimes appear otherwise. I also realise now that I am not that funny or witty, but am ok knowing this and I am not trying too hard to be otherwise. My kids (now adults) can be the most critical of all when I attempt to be droll or humorous… They simply tell me that I’m not – although they are not being unkind. They simply know the difference having known my sister. Destiny can be the longest road travelled between wit and wisdom, but with laughter and joy to sustain us, that journey can be made a lot easier with the people we travel with. Growing up in Dublin, I remember Smithfield Square in the North City area of Dublin as a market. It was a place of traders, fruit and vegetable merchants, and horse fairs. It had a particular character and feel, cobbled and weather-beaten, but it was beloved by many hard working people who were there earning their living . It was regarded as a major trading marketplace for Dubliners. It was a run-down sort of place in the 70’s and 80’s, dilapidated and neglected. Small lock up premises bordered the square on three sides where trade was plied, and vans and horse drawn carts were in and out delivering and collecting. Business was conducted daily and the square was a hive of activity filled with many colourful characters selling merchandise.But at night time the place was deserted and empty. Irish Distillers were located on one side of this square, but the traders were the life force of this inner city square during the day. There was also a horse fair on the first Sunday of every month. This fair was as old as my grandfather could remember and I regularly took trips in with my Dad to watch the trading of horses, donkeys, and other animals during the 60’s and 70’s. It was a bustling fair where horses, ponies, goats and chickens were kept in makeshift pens with other domestic animals. Walking around the square on those Sundays was an experience filled with sights and smells that I will remember forever. I had to hold on tightly to my father’s hand in case we became separated because it was crowded by hundreds of people. Dublin changed, and during the late 1980’s a new city plan was created to redevelop the area. There was a sustained outcry from the people who traded there, but the lockups started to disappear and become boarded up as leases were not renewed. Trade shifted to the more expensive ‘Official Fruit and Vegetable covered market’ off Capel Street and the square became more forlorn and neglected. The horse fair continued on the first Sunday of each month though, despite repeated efforts to close it down. Developers began to buy up properties on the square in the late 80’s and early 90’s, and I clearly remember reading a proposed plan for the area, where it was imagined that it would become a grand piazza or square, modelled on an Italian vision where new urban dwellers could ‘cast their gaze over the space as they sipped their cappuccinos from their apartment balconies during their leisure time’. Coffee culture was unknown in Dublin at that time, and most of us didn’t even know what a cappuccino was or what it tasted like. The developers created wonderful artistic impressions in their sales brochures of this new fabulous lifestyle that they were attempting to sell to Dubliners. It all looked amazing. People talked it up, and there was such a buzz about this new European style apartment living. All looked and sounded great except for the fly in the ointment. In the intervening years when the apartments were eventually built with their balconies and their new urban dwellers, and the whole square was redeveloped, the monthly horse fair continued. There were calls from the health and safety police about animal welfare, rogue trading, and counterfeit selling. You name it; it was all happening in Smithfield on the first Sunday of every month. There were proposals to move the fair to another venue outside the city limits, but the horse traders cited old city by-laws which allowed the trading on site to continue. The market attracted all kinds. And inevitably there were people who ignored standards, and animals were traded and sold to people who didn’t have the animal’s welfare at heart. Reports of cruelty began to surface, and coupled with an influx of young lads who just wanted to buy horses as pets and urban racers, grazing them on common ground in Dublin estates, the authorities were becoming increasingly bureaucratic and wanted the whole fair disbanded. There was a gun attack in the market in 2011 and this signalled the end of the fair. 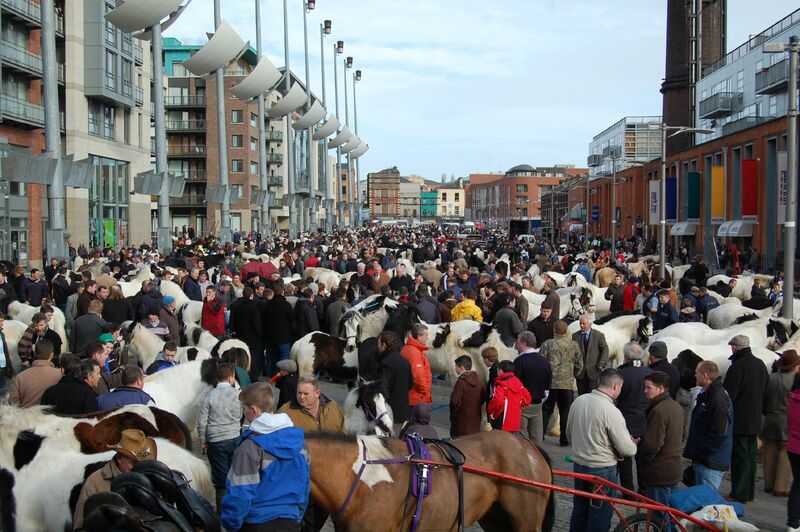 It was simply over and I have no idea where horses are traded in Dublin any more. Smithfield has continued to be redeveloped and now bears all the hallmarks of that once envisioned grand Italian Piazza. It is a place that is on the map of all visitors who come to Dublin, and the Distillery on the corner reaps the rewards from people who pay for the tour to see how Irish whiskey is produced. I went in there tonight to see the Christmas tree that lights the square and reflects on the wonderful ancient cobblestones that hold a million memories, but for me, despite the beauty of the revamped area and the wonderful buzz of contemporary living, it has become a heartless anonymous place. I gazed about, and remembered the sounds that used to reverberate around it, the calls of the merchants, and the banter of the Dubliners who traded there. It is a beautiful space for sure, but it possesses no history or footprint, as that has been obliterated by the urban redevelopment practice that has forgotten that cities need people living and working in them to survive and not just be places for tourists to visit. 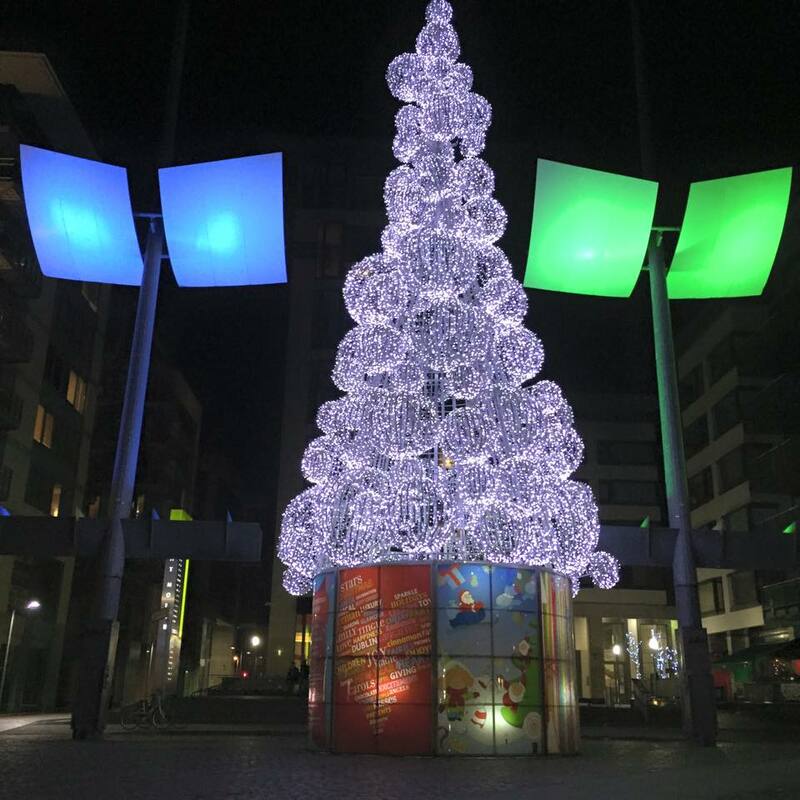 Walking around Smithfield tonight, admiring the Christmas tree, listening to the other visiting people who were doing the same as I was, I could have been in Berlin, Prague, or any other European city. There is sadly nothing left to distinguish it as a place that is recognisably Dublin. Destiny can be about realising that we all need a history to know who we truly are. Is it wrong to look forward to this time of year when I am constantly reminded of all those who I have lost and who will not be present with me during this season of gift giving and family oriented activities. As the old cliché goes ‘misery loves company’ and too often I find myself spiralling downwards in a maelstrom of sadness thinking about the people who I have loved and who are no longer with me. I remember them all the time and reflect on how different my life is without them. Some may think that I am melancholic and miserable, and although I can be, it’s not the hat that I wear 24/7. Planning Christmas for my family, wandering through gift shops and buying presents for loved ones online has created a stark reminder of all who are no longer here with me on this planet. I hate not buying for my sister Annie any more. Almost every time I shopped, online or in real time, I thought of her. If I dared to come home with something that appealed to me, she would ask why I hadn’t bought a replica for her. Silly and inexpensive things mostly, but stuff that we liked and that represented our shared taste. I bought on the double a lot when she was alive. Since her death, shopping has been a major challenge. I cannot view ‘stuff’ without thinking and wondering if she would like it. Is this feeling unique to me, or do others experience this phenomenon. My mam who died two years ago had similar tastes, but didn’t like ‘household’ stuff like Annie and I did. She was always thrilled by a gift that sparkled and that she could wear. My mother in law Bernie who died earlier this year had no time for “gee gaws” as she called ornaments or household embellishments, and preferred to receive the gift of a practical cardigan or something similar. She liked things that were useful to her. Unlike my mam, she never wore jewellery. I never really thought about how shopping for gifts for people that I love was such a minefield of emotion, but I really feel it this year. Everywhere I go I am reminded of what not to buy. Notwithstanding these feelings I am at last looking forward to Christmas. I am looking forward to Christmas despite not having three wonderful women that I have loved collectively for over 50 years being present with me. I am looking forward to Christmas, sharing the day with my very dear and patient husband of over 30 years. I am looking forward to Christmas with my adult children who will come to visit and share dinner with me, and who I have really enjoyed buying gifts for. I am looking forward to Christmas, although it will be a quieter and less crowded affair. I am simply for the first time in five years quietly and smilingly looking forward to Christmas……. Destiny can silently and unknowingly creep up on you and remind you to keep on living. As long as I am alive her touch will be remembered. Her smell, her voice, her kiss, all locked inside me. When I am gone so she will be too, though her image will remain in photographs. Yet who will remember her soft skin, her luminescence. I met my hubby when I was seventeen years of age. He was twenty one. We met accidently through a pal of mine Michael, who was a fresh fruit and vegetable supplier. I was recently broken hearted after a doomed romance with a much older guy, and Michael was seeing a girl who was in a Musical Society in Terenure. He was trying desperately to be her ‘everything’. She needed creative people to help design the background artistic sets for the up and coming local amateur musical production that she was involved with, and he knew that I was imaginative and at a loose end, pining and weeping over a lost love (as only 17 year old’s can be). He called over to my parents’ house in Drimnagh one Sunday afternoon and begged me to come and make ‘Papier-mâché’ for the stage props that were needed. (His agenda was less about me and my feelings, and more about how good I could make him look if I delivered). I capitulated; sighing, filled with angst, and climbed into his vegetable van as we trundled over to Terenure College that fateful Sunday afternoon. It was early April 1978. When we arrived, there was a crew already on stage, painting and hammering. I got stuck in and was soon up to my elbows in pulp, fashioning weird shapes and generally trying to be artistic and creative! It was great fun. I met several people, including Michael’s new squeeze Mary, and lots of others who were happily giving up their time to make this Musical event happen. When I first saw Dermot he was sitting on his hunkers painting long canvases that would be used as backdrops. We chatted and laughed, but I was busy eyeing someone else in the company who was far more appealing to my eye. Jimmy Power! He wasn’t looking at me despite my attempts to catch his eye. The days went by and we all worked together every evening after our day jobs to make this amateur musical theatrical event the best that there ever was. Michaels romance with Mary was blossoming, (they married three years later) but Jimmy still wasn’t catching my eye, even though I threw sultry looks at him regularly. The production was a great hit in the local community and we did five nights that filled the local auditorium to capacity. I loved every minute of it, despite working full time during the day, tearing home after work, jumping into Michaels van and charging over to Terenure every night without a moment to stop for dinner. It was wall to wall fun. On the last night of the show, there was a party. The stage crew gathered in the auditorium after the audience had left. There was wine, beer and music. Jimmy Power still wasn’t interested in me despite my yearnings; he was very much focused on someone else (he married her too). Everybody got a bit squiffy after a while and the party broke up. People went their separate ways and other parties formed. I was invited back to a particular house and instead of taking a cab I decided I would walk. Dermot asked me if he could walk me there. That was the night of the first kiss. The broken and failed romance with the other older guy, and the momentary lust for Jimmy Power faded into the background after that night, and we had the most starry-eyed summer together. It was a time full of fun, shared laughter, blossoming love and simply great times together. I absolutely fell head over heels for this guy and we had a ball. We caught the bus after work in the city most nights and spent our summer evenings in Dun Laoghaire, buying Teddy’s Ice Cream and wandering down to Sandycove, along the seafront. We would stay there until it was almost dark, catching sunsets, and loving the tide coming in and out. We lingered until it was time to catch the last bus home most nights. It was a beautiful courtship, filled with romance, and the ‘getting to know you’ simplicity of young love. One evening six weeks later we were sitting quietly in a Dublin Pub when he asked me to marry him. I thought he was joking and I laughed and told him that I wouldn’t even think of marrying until I was at least 24 !! He went very quiet after that, but sure I didn’t place too much importance on it, he couldn’t have been serious could he? I remember being back in my bunk bed at home in Drimnagh that night feeling a bit uneasy, asking my older sister Bernice who was 19 at the time what she thought. She asked me if I loved him, I said I did. Her reply was ‘well then why not say yes, it’s not like it’s gonna happen tomorrow or anything near it, get the ring, have a great time, and get married whenever you feel like it in five years or more’ ! The more I thought about it, the more it made sense….. I was in love, but still believed I was far too young to get married. I didn’t want to loose him though. I woke up the next day hopeful that I could sort everything between us and bring us back to where we were before. I replied, “You asked me to marry you”. I jumped up and ran to the upstairs toilet to escape the most devastating put down ever!! I sat in the loo bawling my eyes out for ages, wondering how I could ever leave, get home, save my dignity, win his heart back… all those things, but eventually emerged to find him outside the door saying he was sorry that he had reacted that way, but that he had been so hurt by my rejection from the night before, that he lashed out. We got engaged publicly that December 1978 (6 months later –we kept it secret to keep the parents happy) and married three years later in 1981. Despite the roller coaster of a life, ups, downs, highs, lows, we are still together, and I continue to love this man who has brought so much happiness to my life. Destiny can be about taking that jump into the unknown, having no clue as to how it will all turn out. Gone is the saddest word…..
“You too have a song inside. Listen to it”. The Irish Gaeltacht – Triple Bunk Beds and Fridge Freezers….. Closing the door gently behind me…..
Making Military Triangles out of Crisp Bags…. Gazing back and looking forward…..
People you meet on the bus…. 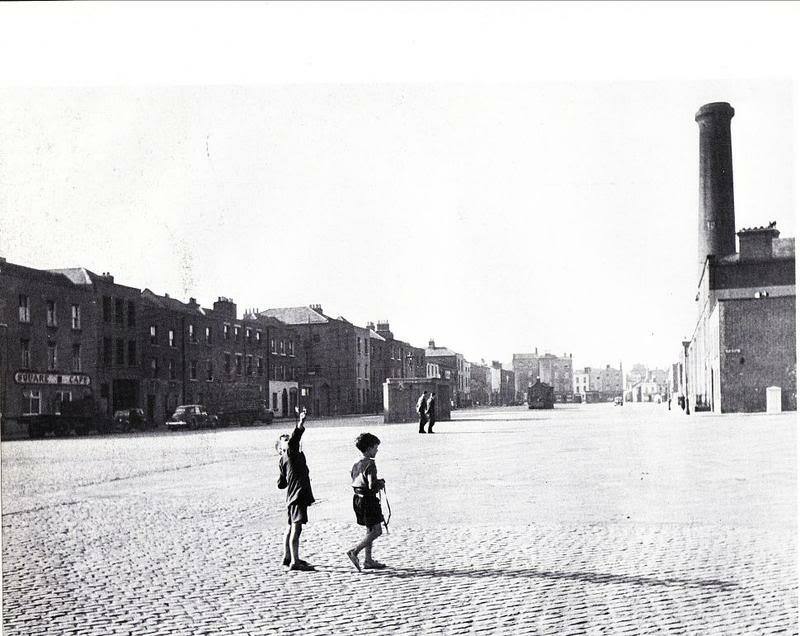 Memories of a Dublin childhood….. Being inarticulate and without words. My sister’s birthday is approaching…..
Health and Safety and the good old days…..
Lighthouses, Cows, Oranges and Bubbles….. Childhood memories of Dublin…. Modern Technology and sleeping naked with German Film Directors…..
Are virtual Internet friends real?